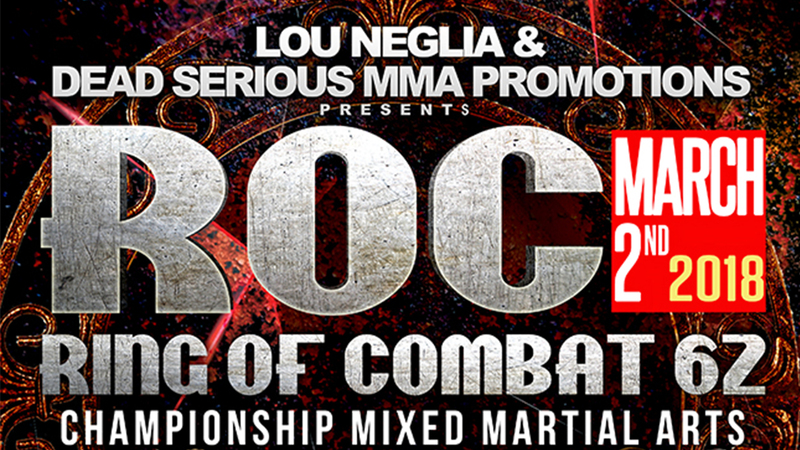 ROC 62 Recap and Results | Lou Neglia's Ring of Combat | Next Generation of Mixed Martial Arts! Winter is not over as it was quite apparent with the weather on March 2nd. The east coast was being bombarded with winter weather advisory alerts all day. Some places were expecting up to two feet of snow. That didn’t stop the fight fans from making the trip to the Tropicana Showroom in Atlantic City, New Jersey. It was a packed house as people came out in droves to checkout what we would become a fight night classic as Lou Neglia and Dead Serious Promotions put on a tremendous fight card for those who were in attendance. What can be typical in the fight game, this fight card was not without its bumps in the road. Earlier in the week, the main-event bout between Jeff Lentz and Julian Lane as called off due to Lentz suffering an injury. There were no hard feelings between both warriors as they were still in attendance to watch the fights. The highly anticipated rematch Lane vs Lane is expected to take place at ROC 63 on June 8th. On fight night, Bill Algeo’s bout with Tevin Cooke was called off just hours before their bout as Cooke became extremely sick and was unable to compete. For those bouts that did take place they did not disappoint. The new main event of Taj Abdul-Hakim vs Bradley Desir was a fast paced bout as Desir began aggressively stalking Taj at the opening bell. Seemingly know respect for Taj’s power, Desir fell victim to an explosive head-kick in the first round as Taj made a successful defense of his welterweight title. The new co-main event was a rematch between two of the best bantamweights on the east coast when Phil Caracappa again took on Brandon Urquijo this time for ROC gold. Just as the first fight, this bout was again close as it appeared Caracappa easily took the first round with Urquijo returning the favor by taking the second. It seemed as if the fight was going to be won in the third. Caracappa began to pull away early in the third round and never let up as he won a unanimous decision and becoming the ROC regional bantamweight champion. Tommy Espinosa became the new ROC bantamweight national champion when he knocked out William Elliot in the first round.